When Betty Berry came to work at Emory, Nixon was in the White House, Neil Armstrong was landing on the moon, gas was 35-cents a gallon, and the Robert W. Woodruff Library was opening its doors. Betty’s career has literally spanned the life of the Woodruff Library, where she has worked for five decades. 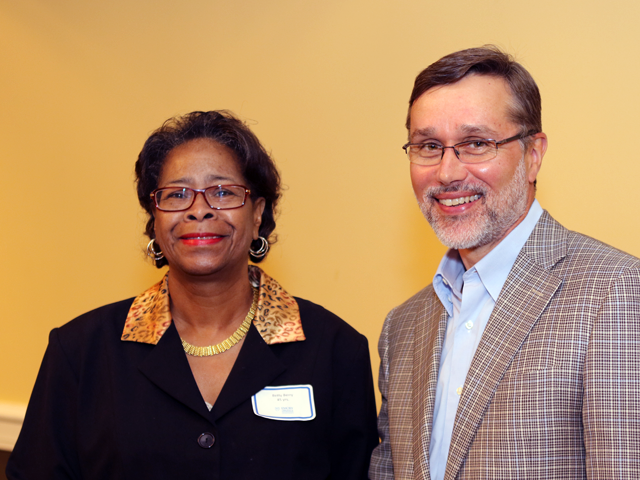 Born in Birmingham, AL, but raised in Atlanta, Betty had just finished a degree in business education from the Atlanta Technical College when she met an Emory recruiter at career day. One of the selling points in coming to Emory was that the library was hiring but the building wasn’t yet open. Betty took the job of library clerk and started at Emory on September 2, 1969. After a few initial meetings in the stacks in the Candler Library, which were being prepped to move into the Woodruff building when it opened, Betty decided to work for Peggy Kline in the cataloging department. Cataloging involved typing the cards for the card catalog. Although the card catalog work was extremely labor intensive, Betty benefitted from being able to use one of the first electric typewriters at Emory. Betty at the LITS Holiday Party in 2017. Over the years, Betty has held a variety of positions. 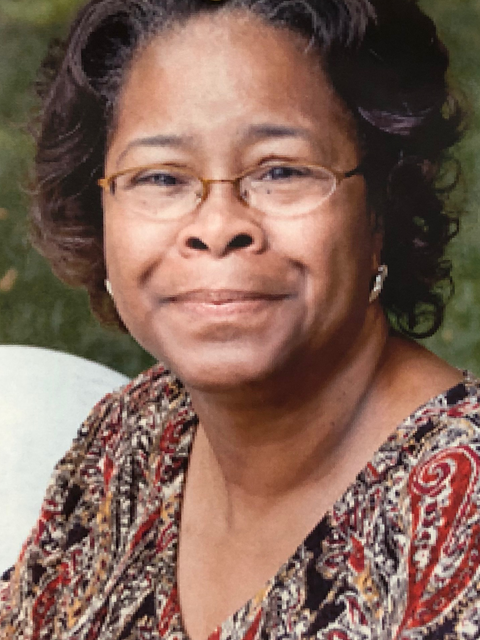 After starting as a clerk and typist, Betty quickly moved into a library assistant II position in 1971, became office manager of the cataloging department in 1981, spent time as the secretary to the department head, then became manager of bibliographic management in 1995, a position she has held ever since. 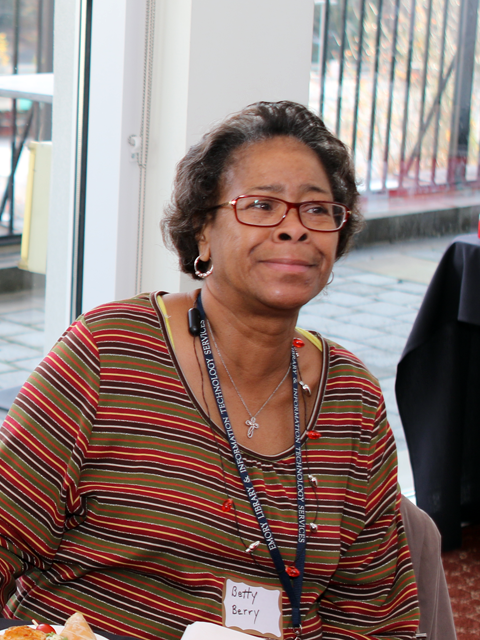 “Being a minority, I always volunteered to be a representative on various committees,” said Betty. She served on the first President’s Commission on the Status of Minorities at Emory (now Race and Ethnicity,) which was started in 1979 after more than a decade of post-desegregation racial tensions on campus. Betty receives her 45-year service award from Rich Mendola in 2016. (CW from top left) Betty Berry, Tracy Preyer, Bev Turner, and Pam Matthews. 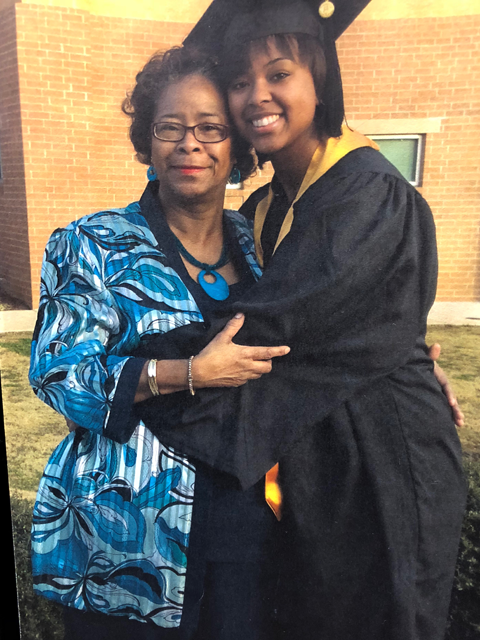 Betty at the graduation of one of her daughters, Thomasinnia. 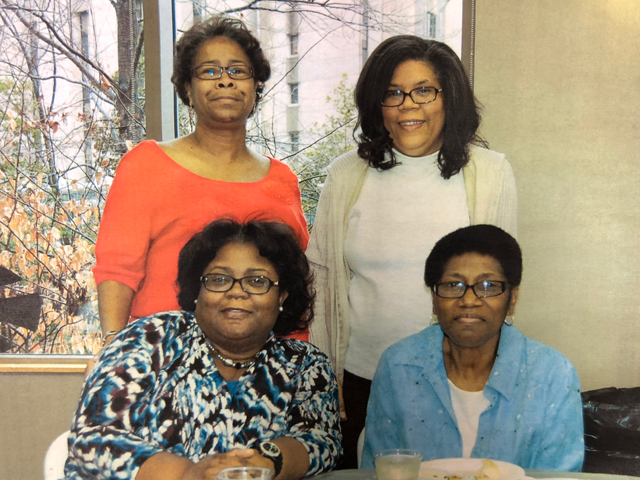 In her retirement, Betty wants to travel to see her sisters and spend time with her daughters, Ashley and Thomasinnia, and her granddaughter Chloee, who is seven years old. “She is a handful!” exclaims Betty. One of her daughters lives in Douglasville so she plans to visit the library there and do volunteer work. This entry was posted in Staff Bytes and tagged Cataloging Department, Emory Libraries, retirement. Bookmark the permalink. Post a comment or leave a trackback: Trackback URL. What a wonderful article about you and your career at the library. You have indeed left your mark there. I am so glad we had the opportunity to work together. Wishing you all the best in your much deserved retirement. What a wonderful story of Betty’s career and I wish her all the best in retirement.